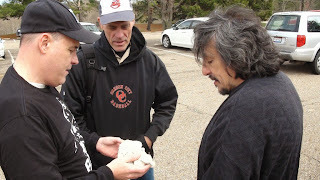 Mark Maisel, Thom Powell, and Esteban Sarmiento discuss a possible Bigfoot print cast. a. Credible researchers should identify the sources for all ideas, information and data from others, and the form in which they were received, recognizing that the unattributed use of another researcher’s work is plagiarism. b. Credible researchers should consistently respect the restrictions on sharing information that arise from the rights of another as an author, originator, researcher, audio analyst, videographer, or photographer; including their research area; or as a party to a mutual agreement. c. Credible researchers should distribute any part of another researcher’s work only with permission. d. Credible researchers must respect the authorship rights of senders of letters, electronic mail and data files, disseminating them further only with the sender's permission. e. Credible researchers should get the permission of the persons who provided information about their research as to the ways it may be used, observing any conditions they impose and respecting any reservations they may express regarding the use of particular items. f. Credible researchers should require some evidence of consent before assuming that people are agreeable to further sharing of information about themselves, their research, their research areas, their files, their photos, their audio, their video or anything pertaining to them. g. Credible researchers should convey identifying information about research—like locations, photos, videos, files or activities, clients, client addresses or phone numbers —only in ways that those concerned have expressly agreed to. h. Credible researchers should recognize that rights of privacy may limit the extent to which information from publicly available sources may be further used, disseminated, or published. i. Credible researchers communicate no information to others that is known to be false, rumored to be false, or appears to be false, or without making reasonable efforts to determine its truth, particularly information that may be derogatory. Northwest Alabama Bigfoot grants permission to copy or publish this material provided it is reproduced in its entirety, including this notice, and not altered in any way. Let's hope this takes hold, it is the only way to bring credibility and validity to the research, all other scientific research is based in these principles.